While moving into my new place in Charlottesville, I came across this newspaper front I designed for the News & Messenger in Northern Virginia. It’s a special commemorative issue for the Battle of Manassas/Bull Run, which took place July 21, 1861. 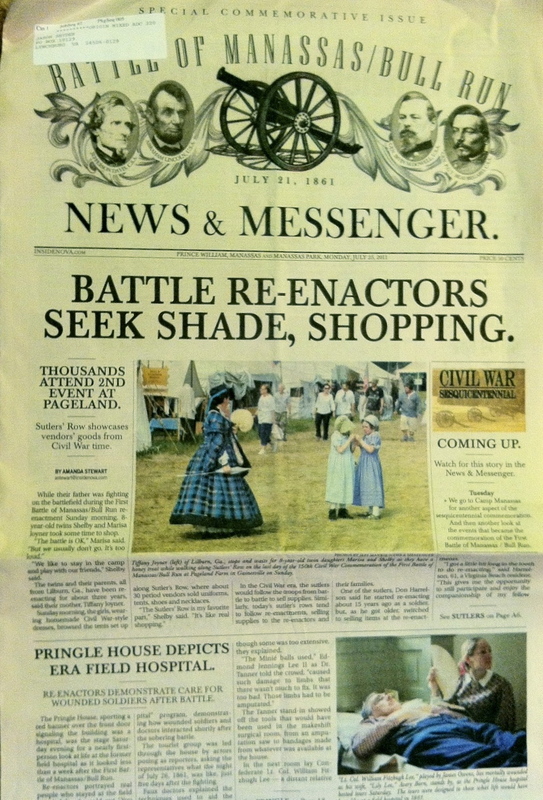 My front ran July 25, 2011 and captured the re-enactment activities. This was a fun design because of the extensive use of rules (in gutters, in-between headlines and decks), all-caps headlines, serifed fonts and italic cutlines. It gave the newspaper that old-time feel. So pretty! I have absolutely zero design skills so I’m doubly impressed by your obvious talent. Thank you, thank you! I was working on Quark for a while, which was terrible and then we changed to InDesign, which is fabulous. It’s a skill that never thought I’d get around to, but now it helps with conceptualizing the components of a story as I write — sidebars, breakout boxes, pull quotes, etc. Thank you, thank you! I was working on Quark for a while, which was telribre and then we changed to InDesign, which is fabulous. It’s a skill that never thought I’d get around to, but now it helps with conceptualizing the components of a story as I write sidebars, breakout boxes, pull quotes, etc.